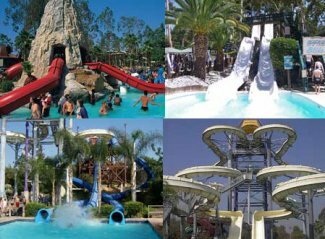 I recently took a trip to the Raging Waters water park in San Dimas, California. I hadn't been there for about 17 years or so. I took three of my children ages eleven, eight and five. Going there I knew that the adult price was $35.99 for adults and $19.99 for kids so I knew I was safe with $100.00 to get in the park. When we got there I was told that the child price was judged by height, not age. If someone was 48 inches tall or taller then you have to pay the adult price for them. Child price is only good for anyone under 48 inches. What if I was a freakin midget! Would I get the children's admission price for Raging Waters? What if you had a giant three year old kid? $35.99? Luckily I had some extra cash because it's cash only! Right away my day did not start out good but it got better. The first ride we went on there was Thunder Rapids and the ride was great. We all got on a raft and right away it went down into the dark. I got to admit if I knew it was as wild as it was I wouldn't have gone on it but afterwords we all loved that we got on it! You could see now that I'm not a big thrill seeker? I am, but not when it comes to water. I never learned how to swim so I have a reason here. Next up was the Ragin Racer and then the Black Hole. Both where exiting rides and the kids loved it. A relative of mine then went on the ride called Drop Out. He wanted me to go on but there was not a chance in hell. It's basically a tall water slide that you just come down on. The thing is really high! Someone told me there that it is seven stories tall. For water thrill seekers you would love it. Time was running out as we arrived there really late so we weren't able to go on many rides but we wanted to check out the more mellow kids rides. The kids enjoyed Kids Kingdom and the Little Dipper but they enjoyed most Splash Island. On a side not here I just want to say about the Raging Waters entry fee. Luckily when we went they had a buy a day and get a day free special going on so we will be returning soon. That makes the entry fee only about $18.00 for each of us. To me this should be the regular price because even though Raging Waters was real enjoyable it was not worth $35.99. Would I recommend Raging Waters to anyone? Heck ya! The place is fun!